The almighty burger keeps reinventing itself to remain relevant, and these days ketchup, cheese and onions are the least of it. Consumers these days hear a lot about regional American cuisine: Southwestern, low country, and low, low country, to name a few. But, be it in Texas, the Carolinas or points between, the simple hamburger remains the quintessential American food. It is the preferred menu item among American men, and second only to French fries among American women. The average American eats one every other day. Five of the nation’s largest restaurant chains menu it, and it accounts for four of every 10 sandwiches consumed in U.S. restaurants. As one pundit once put it, it is to restaurants what wings are to aviation. Fads may come and go, but the hamburger continues to defy gravity. Nevertheless, processors and food service operators still fret that hamburger consumption is declining due to new so-called healthier options, including salads, yogurts and chicken sandwiches. It needn’t be the case, says NPD Group Vice President Harry Balzer. Burger operators tend to keep introducing double and triple burgers intended for young men. Why, Balzer wonders, has no one created a burger especially for women? Instead, McDonald’s and other burger-centric chains typically add chicken and the like to attract women, though it’s worth noting that the Oak Brook, 111.-based quick-service restaurant abides by the 80-20 rule — meaning 80 percent of its profits derive from 20 percent of its products, led by its flagship burgers and fries. McDonald’s does put new spins on old favorites sometimes, though. 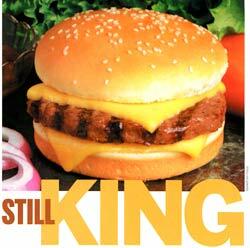 Later this year, it plans to introduce a hip-hop campaign to promote the eternal cool of its 35-year-old Big Mac. On the home front, hamburger accounts for 8.9 percent of all eating occasions, and ground beef for 59 per-cent of all fresh beef served at the dining room table. Sales of frozen ground beef totaled almost $305 million for the 52 weeks ended Jan. 1, 2005, according to research firm ACNielsen. Versatile it is. In Mississippi and Tennessee, there is the soy-enhanced “slug burger” and flour-and-water-cut dough burger, while Texans like their burgers topped with beans, Fritos and Cheez Whiz. Now, there’s regional cuisine for you. If you want to see what’s sizzling on the grill, you might as well start at the top: Wichita, Kan.-based Cargill Meat Solutions, the nation’s largest producer of ground beef. Charlie Fox, Cargill’s vice president and business manager of ground beef, says hamburger consumption patterns are changing, as are the category’s products. Meatingplace: Have sales of hamburger patties been affected by the “healthy movement”? FOX: Yes, our information shows that 70 percent to 77 percent lean volume has been flat over the past 52 weeks. But data also shows that 85 percent to 89 percent lean is up about 8 percent, and that 90 percent to 94 percent lean is up 6 percent over last year. We’re also finding that source grinds (chuck, round and sirloin) are showing increases in volume. Our 96 percent higher-lean, lower-fat product is a steady performer. M: What new case-ready products are you developing? F: Our REDI-Fresh technology is a convenient, leak-proof package with a prominent use-by/freeze-by date. It provides a longer fresh color. Some 100 million REDI-Fresh packages have been sold over the past year or so. 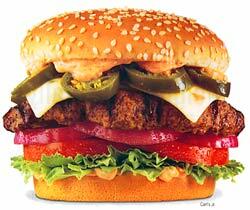 M: What is Cargill doing to brand and merchandise hamburger? F: We have two business-to-business brands in the United States: Excel and Taylor. Some of our consumer brands include Sterling Silver, Angus Pride and Century Farm. We’re licensed to distribute Certified Angus beef. Chubs are becoming increasingly popular as well. We also have a T ‘n T brand, referring to thick and tender. You can cook it at 160 degrees F and hold it for hours. It does well in food service, and we’re evaluating how we can expand it. M: What food safety challenges are you facing? F: We have a leadership role in many pathogen intervention technologies. We also do intervention verification testing, or industry pathogen testing. We test by lot versus total shift, allowing us to minimize the potential of a recall. 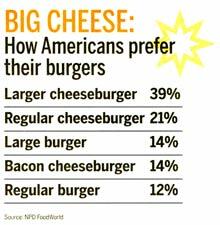 Big is in, particularly among the hamburger’s core consumer — teenagers and adult males under the age of 45. While burger sales in the food service sector rose a modest 2 percent last year, sales of bigger, pricier burgers grew more than twice that fast — 5 percent, according to Russ Klein, global marketing chief of fast-food chain Burger King. On the strength of its Angus Thick-burger, which weighs in at a whopping 2/3 pound, burger chain Hardee’s has seen burger sales in its 2,050 U.S. outlets climb 20 percent since 2003. 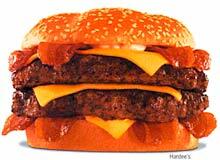 Hardee’s outdid itself in 2004 by introducing the Monster Thickburger, two 1/3-lb. Angus patties, four strips of bacon and three slices of American cheese and pickles, all on a buttered sesame-seed bun slathered with mayonnaise. It’s twice the size of McDonald’s Big Mac, contains 1,420 calories and has been a sensation among men ages 18 to 34 years old. Last year, Clearfield, Pa.-based fast-casual restaurant Denny’s Beer Barrel Pub added the Beer Barrel Belly Buster, a 15-lb. burger molded into a 20-in.-diameter patty on a specially baked bun, to its menu and called it the world’s largest burger. The restaurant challenges any two patrons to eat it within a three-hour sitting. If they do, they get it for free. Others must pay a $30 tab. Think the venerable hamburger is simply sitting around on its bun? On the contrary. Check out some of the burgeoning trends that are reshaping the beloved patty’s future. THE BREAKFAST BURGER: With about 10 percent of all fast-food sales generated in the morning, Carpinteria, Calif.-based burger maker Carl’s Jr. asked itself, why not burgers for breakfast, especially for workers just off the night shift? The chain responded with a char broiled breakfast burger topped with a fried egg, which now accounts for 40 percent of breakfast sales at Carl’s 1,000 restaurants. THE TAPA’S BURGER: Fast-casual chain Ruby Tuesday’s now menus four mini beefburgers as an entree. The burgers can be eaten as a meal or shared as an appetizer before patrons dive into the chain’s Colossal Burger — two 1/2-lb. burgers on a triple-decker bun. The new Jalapeno Burger is not only topped with sliced jalapenos, but pepper jack cheese, Santa Fe sauce, sliced onion, tomato and lettuce. THE WELLNESS BURGER: Ground beef normally isn’t considered a vehicle for wellness foods ingredients, but processor Cardinal Foods blends the fatty acid omega-3 into its ground beef via a thermo-resistant, thermo-irreversible gel. Retailers IGA, Sobeys and Safeway carry the product in their Canadian stores. 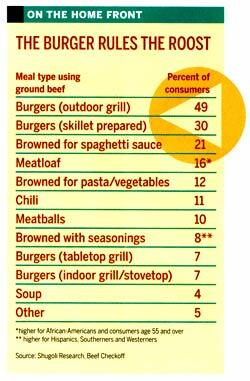 The ground beef contains 300 mg of omega-3, sufficient for a food claim. THE ‘IN’ BURGER: Burger consumers told Whole Foods Market they were bored with plain old burgers, so the retailer stopped piling on the toppings and started mixing them into the ground beef. The burgers contain diced and precooked ingredients such as cheese, bacon, mushrooms and onions.